Did you know that we have three Chardonnays on our menu? Why, you ask? Because we can! The Chardonnay grape is one of the most diverse – and most planted – white grapes on Earth. It’s used for everything from light and zesty champagne-style wines (like our Cuvee Evan and Blanc de Blanc) to rich, buttery California-style Oaked Chardonnay (like our RLS Reserve) and everything in between. The climate and terroir where the grapes grow, as well as the winemaking, are the difference makers here. Today, we are going to talk about our three Chardonnays (only our still wines will be covered in this blog but click here to read about our sparkling Chardonnays), the differences between them, food pairings that go with each and finally tackle some common Chardonnay misconceptions. Instead of only reading about it, I thought it would be fun to do a little video series starring our rockstar duo Kevin and Jane. What makes our three Chardonnays different from one another? Unwooded: all stainless-steel tanks, Citrus aromas of lime and lemon zest are layered atop crisp notes of green apple and pear. Big Paw: new this year, also stainless-steel fermented but a portion of it goes through malolactic fermentation process, which adds texture and body to the wine without losing too much of the floral and citrus aromas that waft off when white wines are aged in oak. RLS Reserve: Classic oaky buttery Chardonnay aged in French Oak, 100% went through malolactic fermentation, which gives it more complexity and a creamier texture with a soft oak finish. Malolactic Fermentation is a process where tart malic acid in wine is converted to softer, creamier lactic acid (the same acid found in milk). The process reduces the acidity in wine and also releases some carbon dioxide. 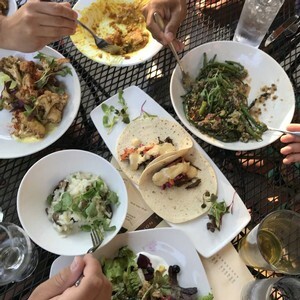 Technically, Malolactic Fermentation is not a fermentation because it does not use yeast, it uses a different kind of bacteria (Oenoccocus Oeni). The result is a wine with a creamy, velvety texture. YUM! 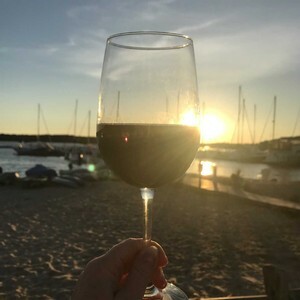 Unwooded: simple wine = simple food, grilled shrimp or chicken or shrimp and grits (but don’t do Cajun shrimp, the spiciness that would overwhelm the wine). Big Paw: a bit more complexity, so go for more complex and heartier food, such as pork tenderloin or grilled pork chips. RLS Reserve: Big butter notes, so it would go great with pasta dishes, such as: carbonara, primavera, or fettuccini alfredo. If you’re feeling extra fancy, pair RLS with a lobster dinner! Side note: there is a simple and delicious recipe at the bottom of this blog for grilled pork chops from Kevin's kitchen! Pouring all three Chardonnays for people at the tasting bar is fun for the staff. People often say that “they don’t like Chardonnay” and typically that means that they have only ever had the traditional oaky Chardonnay and that they don’t prefer the taste. 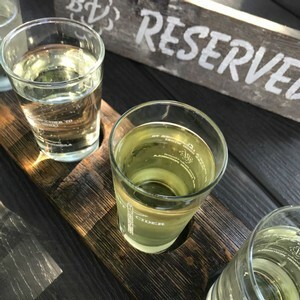 If we can get them to try the Unwooded Chardonnay without telling them what it is, and then they like it because it drinks more like a Pinot Grigio or Sauvignon Blanc, they are always surprised to find out it is a Chardonnay. But that is what wine tastings are for, to open your horizons and try some varietals and styles that you are unfamiliar with. Oaked Chardonnay is like the cilantro of wine, people typically either love it or hate it. We hope you enjoyed our Chardonnay Throwdown mini-series. Stay tuned as we continue having fun educating from behind the tasting bar, as well as behind the camera. Taste. Learn. Enjoy! Shop all of our Chardonnay here. Prepare your chops by rubbing both sides with olive oil. In a small bowl, stir together paprika, thyme, garlic powder, salt, and pepper. Sprinkle the mixture on each side of the pork chops and rub it in. Grill the chops by searing each side for 7 minutes over the high heat. We suggest pairing with Big Paw Chardonnay. Bon Appétit! Winter blues are a real thing. They’re like Monday blues, except they last for like...5 months! I hear you, it’s cold and long and gray. But nothing will make you feel worse than laying on the couch every day and counting the minutes until May. You know the routine, go to work, come home, make dinner, Netflix. Weekends are similar but swap dinner for brunch and work with house cleaning. Rough city! Seriously, if you can survive winter in Michigan you can probably survive anything — but they don't have to be boring. Part of getting through the coldest, grayest months of the year is knowing how to make the most of them. I’m here to give you a list of all things glorious about Traverse City winters. Because after all, you do live in MI, and winter comes every year, and stays for months, so you better just get used to it. Next time you’re sad or bored or feeling claustrophobic, go outside. Put on your winter coat (long underwear, gloves, hat, face mask, snow pants, wool socks, hand and feet warmers, waterproof boots...) and go outside! We live in a Winter Wonderland! This weekly (can you say SUNDAY FUNDAY!) event happens every winter from end of December until middle of March and is so much fun, you might want to do it every single week. 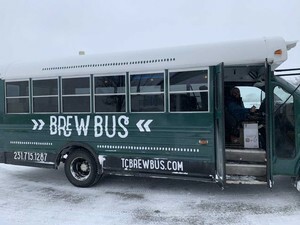 You and all your friends meet at Jolly Pumpkin before being shuttled by the always FUN Brew Bus team to Brys Estate for wine tasting at their gorgeous winery. Sit back and relax while making the tough decision of red, white or rosé (and you don’t have to choose, you can try all of them!) 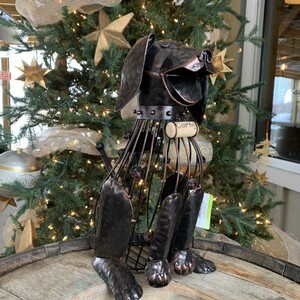 before strapping on your snow shoes and heading to the next stop, Bowers Harbor Vineyards. Enjoy another tasting here and warm up a bit in our heated pavilion and by the roaring fire at the outdoor fire pit. You like S’mores? We have them! And, don’t forget to try a Spirit Cider flavor! 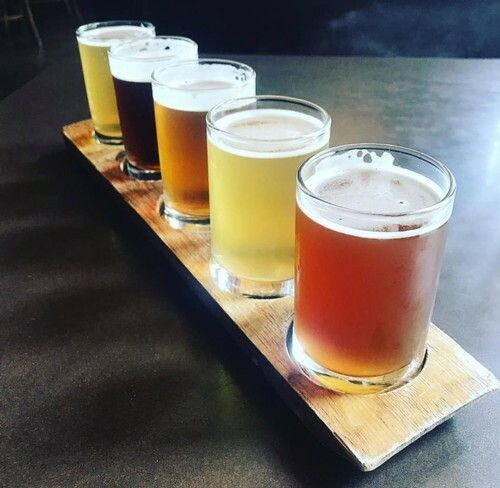 When you’re ready to burn off those calories you just drank, you’ll snowshoe back to Jolly Pumpkin for your final tasting, which can consist of wine, beer and/or spirits! 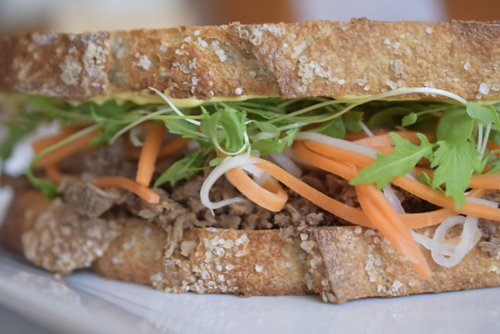 Warm up in their cozy restaurant for some well-deserved lunch. 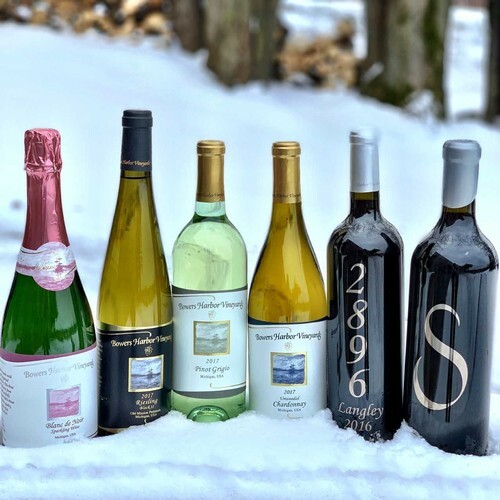 Find out all Snowshoe Wine and Brew information and book your reservations here. I LOVE Hop Lot! What a fun, chill way to spend happy hour or Saturday/Sunday. 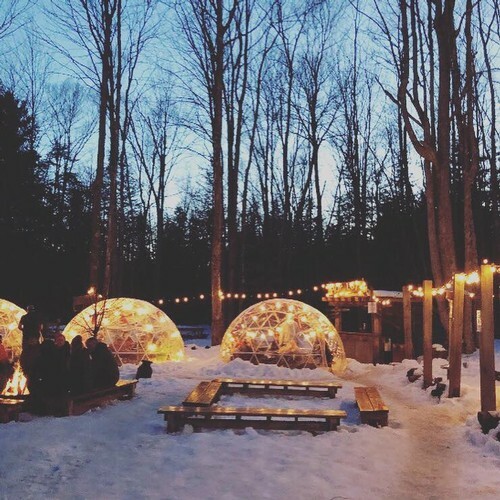 They have a wide selection of delicious craft brews and the ultimate Winter accessory...IGLOOS! You can reserve the igloos for free by the hour and they’re perfect for a birthday or anniversary celebration. 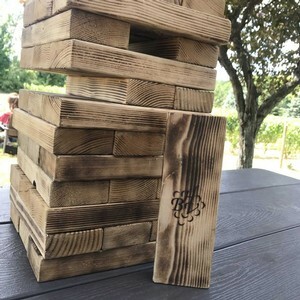 Hop Lot is family-friendly, they have board games to play and sell S’more packs that you and the kids can use by the outdoor fire pits. I love stopping at Mawby on the way for a glass of sparkling wine, which is always beyond delish. 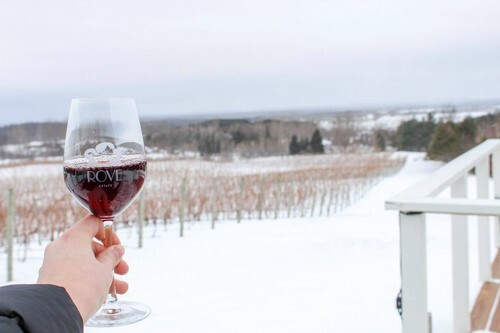 And while I’m at it, I also love stopping at another one of my favorite Traverse City wineries, Rove Estate for a glass of red while gazing out of their windows at the glorious snow-covered vineyards. Sigh, so beautiful. Skiing and snowboarding is SO FUN. I’ll say it again louder for the people in the back. Skiing IS SO FUN! We are lucky to be surrounded by so many hills to ski on, such as Mt. 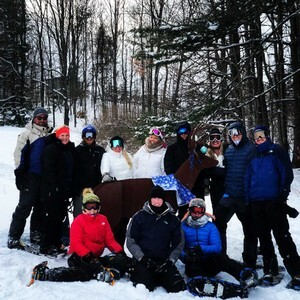 Holiday and Hickory Hills (both perfect for kiddos), Shanty Creek Resorts, Boyne Highlands, Nub's Nob, and Crystal Mountain. 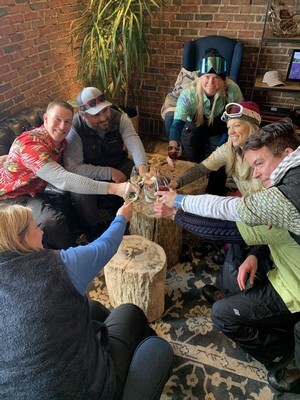 Some of us from BHV take one of our days off, usually a Monday, and head out to ski. We brainstorm new ideas in the car on the way there and back, on the chairlifts and over a couple beers at lunch. I swear some of our best ideas have been hatched during Ski Mondays. It helps to get out of the office, get some exercise, and best of all, get some fresh perspective. Bonding with each other through healthy activities is good for the soul! 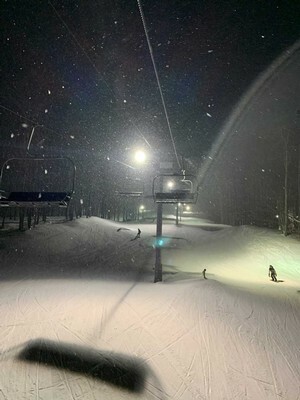 Enjoy night skiing? You can join 106 KHQ at Schuss Mountain on Wednesday nights from 5pm - 9pm for only $10 per lift ticket! One of my favorite places on Earth is Mission Point Lighthouse. It is BEAUTIFUL, peaceful and serene during all times of the year but there is just something extra special about it during the Winter. If you’re lucky you can get miles and miles of fresh tracks through the well-marked trail system. 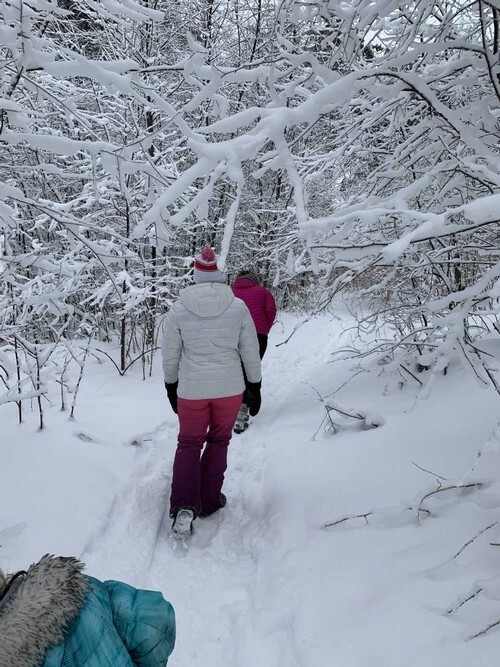 The trails are great for hiking, snowshoeing and cross-country skiing. Does your dog seem bored or depressed? They get cabin fever too! Bring them on your hike and I guarantee you’ll laugh the entire time watching them run and play in the fluffy snow. 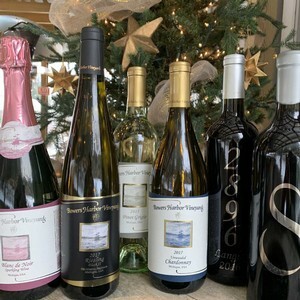 Shameless plug here: Did you know that Bowers Harbor Vineyards does a fundraiser every year for Mission Point Lighthouse? We are going on our 4th year of fundraising and have donated approximately $6100 so far. I went tubing for my first time a few weeks ago and now I am wondering WHY OH WHY did I wait so long to do this? It is SO FUN (see a pattern here?)! 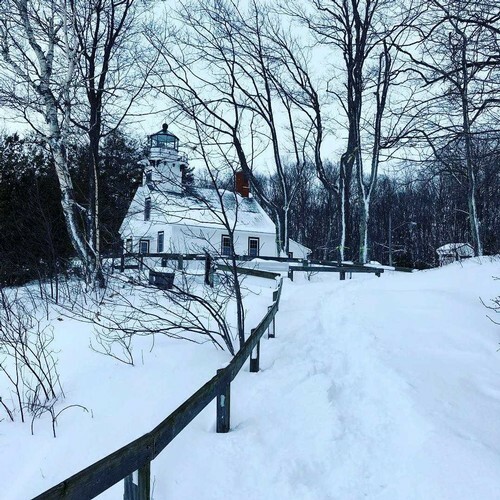 It’s a perfect activity that the whole family can enjoy and there is a great lodge to warm up in afterwards with good food and hot cocoa (AKA toddies). 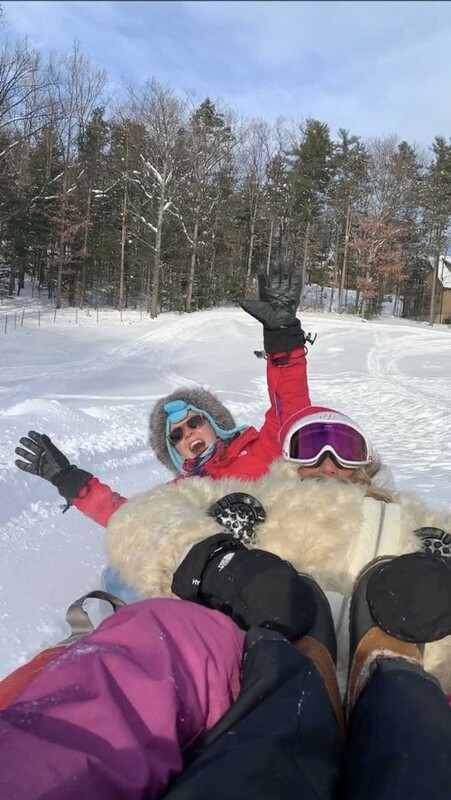 The worst part about sledding is climbing back up the hill after going down, right? No need to do that while tubing, just grab onto the tow rope and ride up in your tube! You can have all this fun for only $10! Have you been in this gorgeous trail system yet? If not, go ASAP! Picture 250 acres of rolling hills with views of three different lakes (Long, Fern and Page). The property is a combination of mesic northern hardwood forest, fields and riparian wetlands and is truly stunning. The trails are perfect for dogs, hiking and snowshoeing and many of the trails lead straight to the lake for easy ice-fishing access. To me, nature is peace and I absolutely love the serenity of this land, which is protected by The Grand Traverse Regional Land Conservancy. The moral of my story is this...there are so many things to do in Winter and staying inside for 4-5 months straight isn’t good for anyone. Fresh air, fun and exercise are all needed for well-rounded lives and we are lucky to live in a place with so much to offer year-round! 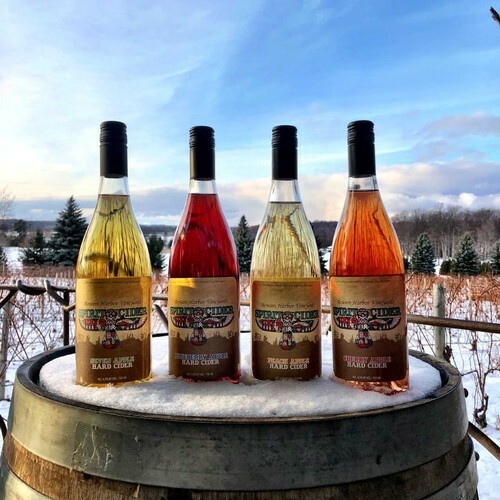 We LOVE Traverse City's Restaurant Week and we are beyond excited to have our wines make some appearances at our favorite restaurants. 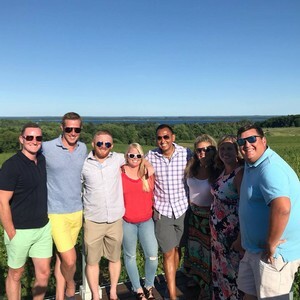 First Up is Aerie Restaurant, which is located inside the Grand Traverse Resort and Spa! Port-Style Cordial perfect for sipping after dinner. Rich cherry flavors with a sweet satisfying finish. It is VERY hard to believe but 2019 is right around the corner...no really it is, it’s in 5 days! I’ve been going back and forth about what I want to do for New Year's, how do I want to ring it in? I’ve decided that I want to switch it up this year and cook a New Year's Day brunch for me and my husband. But (here’s another twist), it will be a Spirit Cider-inspired brunch! Everyone goes the sparkling wine route for New Year’s Eve so I thought it would be fun to be bold with Spirit Cider instead. Here’s my menu if any of you want to try this too! Muddle blueberries, lemon juice and simple syrup in a shaker tin. Add vodka and ice, and shake. Strain over fresh ice into a pint glass. Top with Blueberry Spirit Cider (fill the rest of your pint glass) and garnish with a lemon twist. Pour Spirit Cider into a Champagne flute, top with OJ and garnish with orange slice. Days where brunch is involved are the best days – am I right? You can sleep in, maybe get a workout in before (if you’re feeling feisty) and meet your friends for a hearty meal and a carafe (or 10) of mimosas. Then a nice long nap and you have had yourself a nice little Saturday. Sound familiar? What is brunch without carbs? It’s not brunch at all in my book! Here I am to introduce you to the carb of all brunch carbs...a Dutch Baby, which is a light and puffy/fluffy pancake that actually pairs amazingly well with our Spirit Cider. Put 1 tablespoon of the butter in a 10-inch cast iron pan and heat the pan in the oven for 10 minutes. Melt the remaining 2 tablespoons of butter and set aside to cool slightly. Pulse together the flour, sugar and salt in a blender or food processor. Add the eggs, milk, vanilla extract and melted butter, and blend the batter until smooth and frothy, 30 to 45 seconds. Carefully remove the hot skillet from the oven and immediately pour the batter into the center. Bake for 20 minutes, do not open the oven while baking. The Dutch baby will puff up in the center and the edges will be dark and crispy. Serve warm with a sprinkling of powdered sugar, a handful of blueberries and lemon wedges for squeezing. Simmer the apple slices in the Seven Apple Spirit Cider until they just start to turn tender, about 3-5 minutes, remove and set them aside. Simmer the remaining cider to reduce to about 2 tablespoons. Meanwhile, cook the bacon in a pan and set aside. Brush a sheet of phyllo pastry with the olive oil and fit it into the bottom of a greased 9 inch pie dish or springform pan with the ends hanging over the side of the pan and repeat with the remaining sheets placing them on top. Toss the apple slices in the reduced cider and spread them out over the bottom of the pan. Sprinkle the bacon, rosemary and cheddar cheese on top of the apples. Mix the eggs and half and half, pour into the pan and fold the edges of the phyllo dough that is hanging over the sides. Bake in a preheated 375F oven until golden brown and set in the center, about 45 minutes (check every few minutes after 35 minutes for desired doneness). Make ahead hint: I plan to make this on New Year’s Eve and just pop in the oven the next day. I’d pair both of the above dishes with any of our fruity Spirit Ciders – and I AM going to pair them with BOTH of the Spirit Cider cocktails above. Give it a try and let me know what you think! I'm wishing the best year yet for all of you, Happy New Year! She's baaaaaack! We know you're stocking up for all of the holiday parties you have coming up, and we know you need more wine for your own personal stash...so we have ONE MORE chance for you to stock up and save BIG! This will be the last shipping promo we do until February! 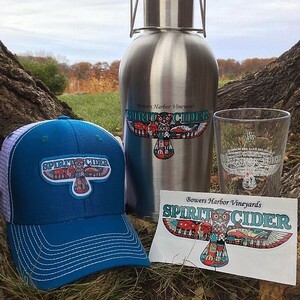 Enjoy $5 Shipping for 12+ bottles and $10 shipping for 6-11 bottles of Wine and/or Spirit Cider! *Offer is valid Monday, 12/10/18 - Monday, 12/17/18 and 11:59 p.m.
*This shipping promotion may not be used in conjunction with your quarterly wine club shipment. 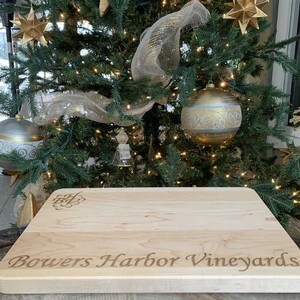 How cool is this cutting board with the BHV logo?! It is made out of smooth, light wood and would also be perfect for serving or displaying several cheeses or appetizers at a party! Do you have a chef in your family who would love one of these? We have so many cute and sassy box signs that I'm sure you'll be able to find one that speaks to you! I love setting these up around my house as a little reminder not to take life so seriously. 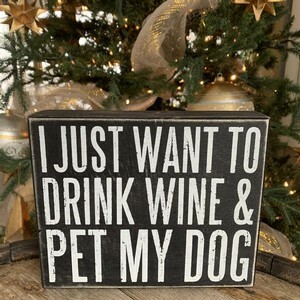 Also, since this box sign is talking directly to the dog lovers, I must point out that we have a whole page in our online gift shop dedicated to dog lovers. This adorable coffee or tea mug also has our BHV logo on the back. It's calling your friend's name (you know, the one who complains about work a lot or the one who has small children?)! Who's the crafter in your life? Chances are, she's done a cork project at some point in her crafting career. These cork cages are a cute way for her to save her corks for her next project! I also love to use mine to save the corks of all the super special bottles of wine we drink, as a way to remember them and the great times we had. We have tons of different cork cages, check them all out here. 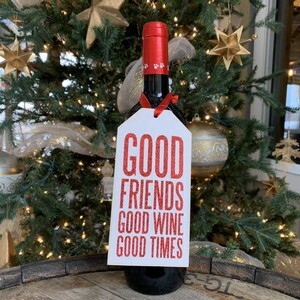 Wine bottle tags are the perfect addition to the wine you always bring as a hostess gift. 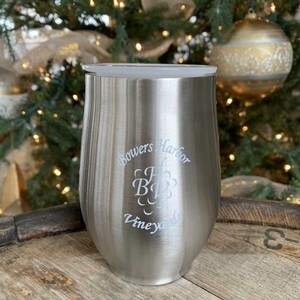 This little memento will make your wine bottle stand out against all of the others and bring a smile to her face. Check out all of the wine bottle tags we have and pick one that reminds you of her, for an extra (and thoughtful!) gift. 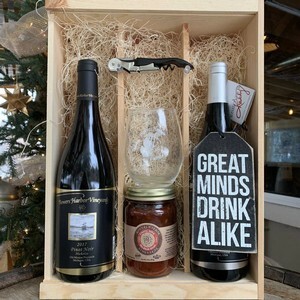 Wine gift boxes are a great way to show your love from afar. They are stuffed with local products, two wines each and are really fun to open! We have three different boxes to choose from, our Red Wine Gift Box which is shown to the left, a Flagship Wine Gift Box and a Dog Lovers Wine Gift Box. You can see them all and their contents here. These to-go sippy cups are so popular! I'm gifting one in a white elephant gift exchange because I know my friends will fight over it. 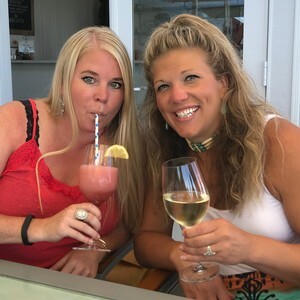 They love their wine to-go...not in an illegal way or anything, more in a to-go to the beach, to-go outside, to-go on a hike...kind of way. They are stainless steel with your choice of white (shown here), teal or pink lid! Gift cards serve many purposes. They allow the giftee to pick out their own gift, they're perfect for "the person who has everything", they are easy to mail in a card (or simply e-mail), you don't have to wonder whether they will like it or not...and the list goes on and on. 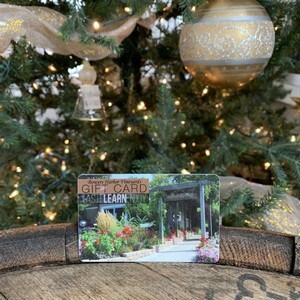 We have a plastic gift card (shown here) that you can add to a card or we have an e-gift card that you can send to them via email. Both options are here! 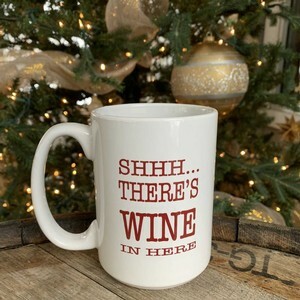 And last but certainly not least...don't forget about wine! Everyone needs it! Especially delicious wine and Spirit Cider from Bowers Harbor Vineyards. We have sparkling, red, white, dessert wine and hard cider sure to satisfy even the toughest of critics. Blanc de Blanc: Bright, fresh notes of green apple and lemon-lime make great dance partners with all those gorgeous bubbles! Pairs well with the salty, nutty, and creamy flavors, such as Baked Sausage & Brie Appetizer. 2017 Unwooded Chardonnay: Lean citrus aromas of lime and lemon zest are layered atop notes of green apple and pear. Pairs well with Citrus Roasted Turkey! 2017 Riesling, Medium Dry: The acidity in this wine is great with spice, and the fruitiness would perfectly match the crisp apple component in Sausage and Green Apple Stuffing. Winston: Lots of intense, plummy, jammy flavors with spicy, peppery notes. Pair with Cranberry–Berry Compote. 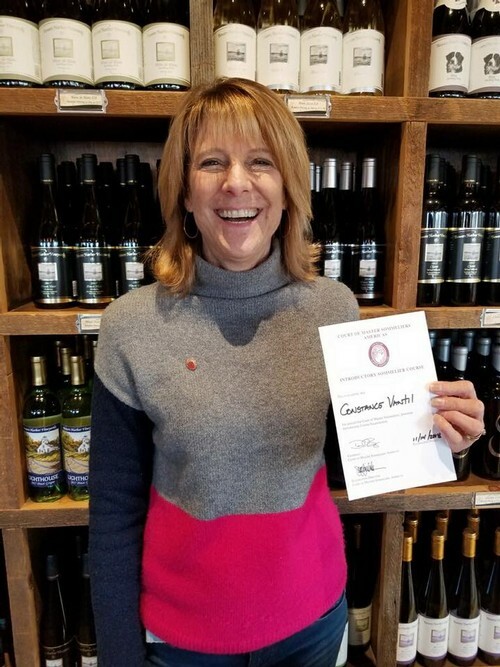 2016 Pinot Noir, Wind Whistle: Look for bright cherry and raspberry flavors, balanced by toasted caramel contributed from our high quality French Oak barrels. Pair with Garlic Mashed Potatoes. 2017 Gewurztraminer, Late Harvest: Indulgent aromas and candied pear and pineapple segue into mouthwatering notes of honeyed orange and cantaloupe, with a whisper of spice on the finish. Pair with Cherry Pie for a Traverse City twist on a traditional Thanksgiving dessert! You may have heard the good news! We have THREE new and very glorious red wines! 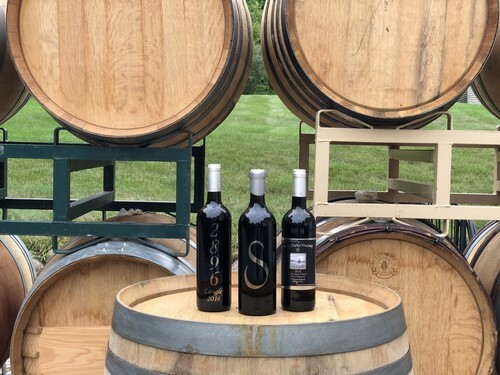 We know you have been “patiently” waiting for the release of these red wines and we are so excited to announce that they are available for both tasting and purchase! We are doing a special tasting fee of $5 to taste all three of the new wines, so you can either taste these in addition to your normal five for $5 or just come in and taste these three. Wine Club Member? You can taste them for free as part of your normal free tastings per visit! 18 months of aging in French Oak barrels: first and second use. Tasting Notes: Ripe raspberry, rosemary, grippy structure from the tannins of the thick skins of the Cab Franc, long finish. Age 1-2 years before drinking. Will age 8-10 years, plus. Tasting Notes: Blackberry, tellicherry peppercorn, chocolate. Age 2-3 years before drinking. Will age 10-12 years, plus. 18 months of aging in French Oak barrels: ALL FIRST USE BARRELS ONLY!!! $1200 EACH! Tasting Notes: Currant, leather, tobacco. Age 3-4 before drinking. Will age 12-14 years, plus. Cabernet Franc, 2896 and Selection S are only produced on really warm, perfect grape growing vintages. We are not able to make them every year. In fact, we have only made the Selection S twice, in 2012 and 2106. The prices of these wines are based on the growing season and quality of the grapes, the cooperage and barrel selection we use and how many times the barrels are used, and the potential to age and mature beautifully. The 2896 was $50 in 2010, $75 in 2012, $55 in 2013, and we were not graced by Mother Nature to be able to make it in 2014 or 2015. Spencer feels this wine is even better than the 2012! The barrel program Spencer has built with Bryan Ulbrich (our talented winemaker) and several high-end cooperages from France is like NO OTHER barrel program in the Midwest. The time and money spent on this program is remarkable and focused. We have 20 years of barrel experience and have improved the program each year by learning, tasting, listening to Mother Nature, training our vines and taking meticulous care of them, and only bottling our high-end reds in the superior growing years. It is a three-year process for each vintage to really see what barrels perform the best. We’ve taken Old-World lessons in this aspect of winemaking to learn, modify and improve every time we make wine. The 2896 wine was aged 18 months in first use and second use barrels. They cost approximately $1,200 each, and we only use the barrels twice for this program. For the Selection S, we aged this wine for 18 months in all brand-new barrels; expensive but worth it! This will give this wine the ability to age 10-15 years, and give it a complex flavor and finish. In today's fast-paced, instant gratification world, the concept of buying wine and purposefully laying it down to age is a bit counter intuitive. Trust us. This wine is worth waiting for! When it comes to fine red wine, patience truly is a virtue!! AGE THE WINE! We believe in you! You can do it! You will thank us!